Russia and U.S. flex muscle. Are they preparing for nuclear war? Then you need to pay close attention to what’s going on between the U.S. and Russia. It was a few weeks ago when Americans all along the western seaboard noticed something quite peculiar. High above them a bright and shiny object moved with alarming pace. Of course many suspected what they saw was a UFO. A few short hours ago the rest of the nation (and the world) would learn this was no UFO. 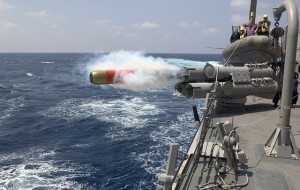 It was actually a missile being tested by the U.S. Navy. Now here’s the thing about this test. Amazingly enough none of this happened? Experts suggest the reason the U.S. did this was to show our enemies (Russia and China mainly) we’ve got plenty of muscle if they try to attack us. The Trident missile, built by Lockheed Martin, is a thermonuclear missile system (Fleet Ballistic Missile) with a range of at least 4,000 nautical miles. Just one Trident missile launched from somewhere in the Pacific Ocean could devastate China with a nuclear strike on Beijing. And here’s the scariest part. In fact just days ago they accidentally leaked secure documents on Russian state television where their newest and most frightening nuclear weapon was revealed. A nuclear torpedo capable of traveling 6,000 miles and creating a 1,000 foot tsunami. It also features one of the deadliest warheads ever created. Now you can see why nuclear war really is something we need to be concerned with. Russia Is Ready, Is Nuclear War Their End Goal? Here’s what the BBC reported about Russia’s deliberate leak. The leak happened during a report on state-run Channel One about President Vladimir Putin meeting military chiefs in the city of Sochi. One general was seen studying a diagram of the “devastating” torpedo system. Launched by a submarine, it would create “wide areas of radioactive contamination”, the document says. 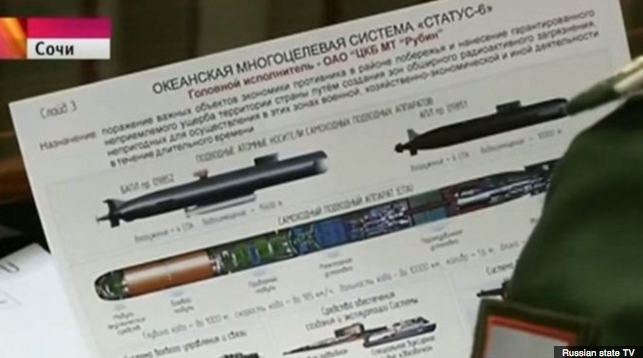 However, the Russian government newspaper Rossiiskaya Gazeta later reported details of the weapon, without showing the diagram, and speculated about a super-radioactive cobalt device. So the leak may not have been accidental. Just before the torpedo diagram came into view in the state TV report, Mr. Putin could be heard telling the generals that the US and its Nato allies were forging ahead with a global anti-missile defence system “unfortunately ignoring our concerns and our offers of co-operation”. He said the Western defence project was “an attempt to undermine the existing parity in strategic nuclear weapons and essentially to upset the whole system of global and regional stability”. The U.S. is developing the sea-based Aegis Ballistic Missile Defence (BMD) system to counter the perceived threat of short- and medium-range ballistic missiles from Iran or another so-called “rogue” state. Under the plan, air defence missiles will eventually be sited on land in Romania and Poland. Mr. Putin dismissed that Nato argument, pointing to the international deal, agreed this year, imposing limits on Iran’s nuclear programme. “References to an Iranian or North Korean nuclear missile threat are just used to conceal the true plans – their real goal is to neutralise the strategic nuclear potential of other nuclear states… above all, of course, Russia,” Mr Putin told the generals in Sochi, a Black Sea resort. He said Russia would continue developing strategic offensive systems capable of penetrating any anti-missile defence. “But it can be considered as a means of deterrence – like the Perimetr system, which is on combat readiness, which guarantees retaliation with all of Russia’s nuclear forces even if command posts and the country’s leadership have been annihilated”. I’m sure you’ll agree this is bad, bad news. Tensions between us and the Russians don’t seem to be abating either. And with what’s going in the Middle East and with Obama about to leave office it remains to be seen how stable things will remain…nuclear war could be imminent. Because our relationship with countries like Russia and China seem to be getting worse and worse it’s a good idea to get prepared now. I’ve written on nuclear survival secrets before (here’s the article). 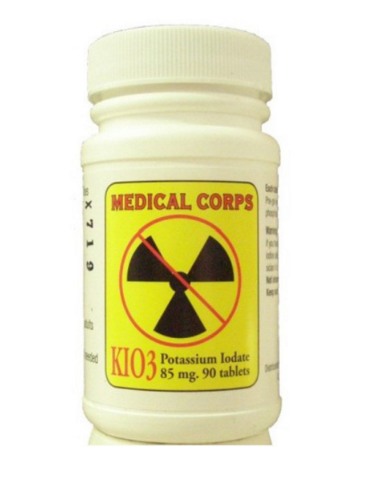 One of the most useful items that’ll help keep you safe in a nuclear attack is Potassium Iodate. This pill helps protect you from radiation poisoning. Maybe that’s why the U.S. military is stocking up on it. 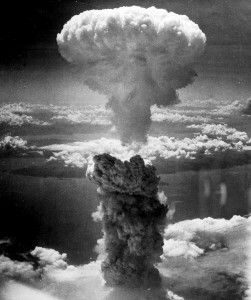 If you want to use the same nuclear protection as the U.S. Government then click here. You NEED radiation poisoning protection. Get yours today! This entry was posted in Emergency Preparedness, Emergency Survival, Martial Law, Nuclear Survival on November 18, 2015 by Survival Frog.